'The Rum Diary' movie quotes include numerous lines from Hunter S. Thompson's classic novel, adapted for the big screen in 2011. 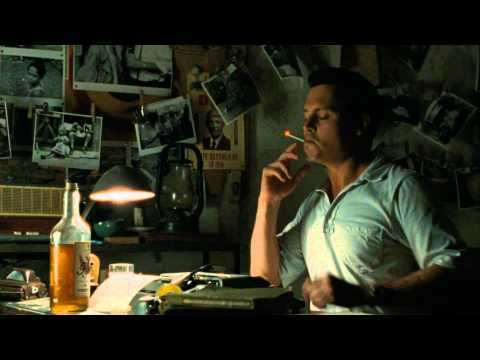 Not surprisingly, Johnny Depp, as freelance writer Paul Kemp, utters some of the best quotes in the 'Rum Diary' film. This list includes some of the most memorable quotes from 'The Rum Diary,' so be sure to vote up your personal favorites. If you see a quote that's missing, definitely add it! Writer Paul Kemp's decision to take a job at a Puerto Rican newspaper in the late-1950s proves fateful, as he's drawn into a seedy world filled with greedy American entrepreneurs who are eager to make big money from the island's abundant, undeveloped land. 'The Rum Diary' movie is directed by Bruce Robinson and also stars Giovanni Ribisi, Amber Heard, Michael Rispoli and Aaron Eckhart. 'The Rum Diary' grossed just over $13 million in the weeks after it's theatrical release on October 28, 2011. 'The Rum Diary' DVD was expected to be released on February 14, 2012. So what are the best Rum Diary quotes? That's up to you to decide. Lotterman: "How much do you drink?" Paul Kemp: "The upper end of social." As in, more than 150 hotel miniatures. Way more. Paul Kemp: "I want to make a promise to you, the reader. And I don't know if I can fulfill it tomorrow, or even the day after that. But I put the bastards of this world on notice that I do not have their best interests at heart. I will try and speak for my reader. That is my promise. And it will be a voice made of ink and rage." Kemp has had enough. He's determined to expose the greedy Americans looking for profit in Puerto Rico. In between drinks, of course. Paul Kemp: "Human beings are the only creatures on Earth that claim a God, and the only living things that behave like they haven't got one." Sala: "You're high you fool, drink some rum!"